This chapter presents a range of heuristic lessons from the histories of print, telegraphy, and broadcast, focusing on how these technologies have been and remain implicated in exercises of power bearing on specific populations, and how they have been apprehended as harbingers of change. Discussing some “past” communication technologies, it moves backward and forward between centuries and between “older” and “newer” media: for example, between older and newer ways of “doing the books” and the kinds of individuals these practices have helped form. 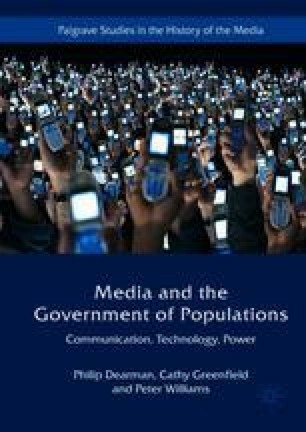 In so doing the chapter explicates how communication technologies are part of governing populations, the formative dimensions of this approach, and the inseparable link between communication technology and the political technology of individuals. Australian Government. 2007. “Guide to the Teaching of Australian History in Years 9 and 10.” https://www.htansw.asn.au/docman/2007-destguidetoteachinghistory11oct/download. Donadio, Rachel. 2015. “Before Paris Shooting, Authors Tapped Into Mood of a France ‘Homesick at Home’.” New York Times, January 8. http://www.nytimes.com/2015/01/09/world/europe/provocative-books-tap-a-mood-of-profound-french-anxiety-.html?_r=0. Fellowship of First Fleeters. n.d. “Fishburn.” Manifest. http://fellowshipfirstfleeters.org.au/ship_fishburn.htm. First Affirmative. 2015a. “Sustainable and Responsible Investing in the United States”. http://www.firstaffirmative.com/resources-news/publications/sustainable-and-responsible-investing-in-the-united-states/. First Affirmative. 2015b. “Our Vision.” http://www.firstaffirmative.com/about-us/our-vision/. Howard, John. 2006. “John Howard: Standard Bearer in Liberal Culture.” Australian, October 4. http://www.theaustralian.com.au/opinion/john-howard-standard-bearer-in-liberal-culture/story-e6frg6zo-1111112306534. Loyola. 1914. The Spiritual Exercises of St. Ignatius of Loyola. Translated from the Autograph by Father Elder Mullan, S.J. New York: P. J. Kennedy & Sons. http://www.jesuit.org/jesuits/wp-content/uploads/The-Spiritual-Exercises-.pdf. Mackenzie, Craig. 1997. “Ethical Investment and the Challenge of Corporate Reform.” Unpublished thesis, University of Bath. http://staff.bath.ac.uk/hssal/crm/phd/crm-phd.pdf. Murdoch, Rupert. 2009. “Speech by Rupert Murdoch at World Media Summit.” The Weekend Australian, October 10. http://www.theaustralian.com.au/business/media/speech-by-rupert-murdoch-at-world-media-summit/news-story/e4009e47dc2064d45d46c8e45fab97fb. Museum of Australian Democracy. n.d. “Milestones in Australian Democracy.” http://explore.moadoph.gov.au/timelines/milestones-in-australian-democracy#milestone=first-printing-press. Northern Territory Government. 2007. Little Children Are Sacred. Report of the Northern Territory Board of Inquiry into the Protection of Aboriginal Children from Sexual Abuse. http://www.inquirysaac.nt.gov.au/pdf/report_by_sections/bipacsa_final_report-front_cover.pdf. Social Funds. 2009. “Introduction to Socially Responsible Investing.” http://www.socialfunds.com/page.cgi/article1.html. Tiffen, Rodney. 2014. Rupert Murdoch: A Reassessment. Ebook. New South. https://www.newsouthbooks.com.au/books/rupert-murdoch_a-reassessment/. Yardley, Jim. 2008. “China’s Leaders Try to Impress and Reassure The World.” New York Times, August 8. http://www.nytimes.com/2008/08/09/sports/olympics/09china.html?pagewanted=all&_r=0.